If you have been thinking about getting dental implants, you probably have a lot of questions. We have put together some information to answer the most frequently asked questions regarding dental implants. Do I hide my smile because of unsightly spaces between my teeth or because I am missing teeth? Do I lack confidence when I smile, speak or eat? Am I having trouble eating, chewing, or speaking properly? Are my teeth loose, or am I in need of treatment for advanced gum disease? Do I have dentures that slip or cause sore spots when I chew? Do my dentures need to be relined frequently because of bone loss? Do I carry my complete or partial dentures in my pocket or leave them at home? Am I having any problems with existing crowns or bridges, either functionally or cosmetically? Are the teeth holding my bridge loosening or moving? Can I wait six to nine months for the entire implant process to be completed? Will I be willing to commit to the high standard of home care that is necessary to properly maintain a dental implant? Will I follow up with regular dental check-ups? Do I believe that my life could be improved if my teeth were improved? Have I been told that there is no other alternative to improve my dental situation? If you answered “yes” to one or more of these questions, you may be a candidate for a dental implant procedure. Dental implants eliminate the pain and discomfort of removable full or partial dentures. Dental implants can eliminate the numerous embarrassing inconveniences of removable partial and full dentures. Aesthetically, they support teeth that look like real teeth. Functionally, dental implants feel and act like real teeth. 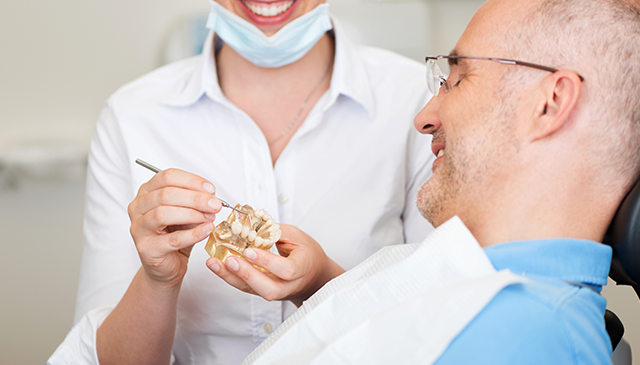 What are implant supported dentures and their benefits? Dental implant supported dentures eliminate the need for distasteful adhesives as with conventional dentures. There is no longer a need to use “glue” when your prosthesis is anchored to implants. Dental implant supported dentures can actually improve the taste of food. With less plastic covering the roof of your mouth, you can enjoy natural flavours and sensations again. For any further information on dental implants, please do not hesitate to contact us and make an appointment.